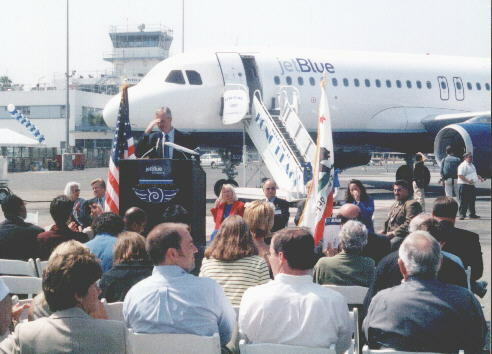 (May 24, 2001, updated May 29 (w/ color map) -- In a dramatic move that could fill LB skies with 41 commercial flights per day within two years or less, JetBlue -- a highly rated, low fare, high amenity and reportedly well-capitalized NY airline -- has made LB Airport its de facto second national hub. Following discussions with City Hall out of the public eye, JetBlue took all 27 vacant commercial LB flight slots within days of a May 15 City Council vote (previously detailed by LBReport.com) letting airlines hold slots up to 24 months before flying. Official word came at a May 23 LB Airport news conference attended by an array of LB officialdom, business and aviation interests. Those on the dais included Mayor Beverly O'Neill; Councilmembers Bonnie Lowenthal, Jerry Shultz, Frank Colonna, Jackie Kell and Laura Richardson-Batts; JetBlue CEO David Neeleman; City Manager Henry Taboada, LB Area Chamber of Commerce President Mike Murray and LB Airport Area Business Council chairman (and Airport Advisory Commission member) Curt Castagna. On May 15, Councilmembers voted 8-1 (Carroll dissenting) to relax LB's flight slot rules, allowing airlines to hold flight slots for up to 24 months before flying (instead of only six months). No Councilmember (including Carroll) publicly opposed City Hall's policy of working to fill all 41 commercial flight slots, a level that previous City Hall administrations considered an imposed maximum, not a desired goal. 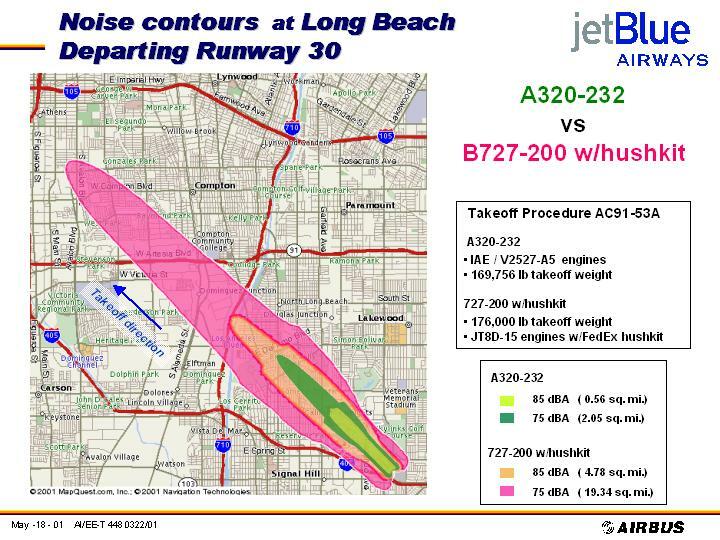 At the news conference, JetBlue officials displayed a color noise contour map (right) indicating that a retrofitted ("hush kit") 727's high noise contours (85 dB and 75dB) extend a considerable distance from the Airport while the JetBlue Airbus' noise contours are significantly closer to or within airport grounds. JetBlue offered the color contour map in digital form to LBReport.com. JetBlue also provided, and we have posted in full, a multi-page document from the company indicating other comparative noise contours and data. For flexibility, we have posted the document in two forms. We have posted each page in .jpg form (each page is approx. 80kB-100 kB), and also posted all nine pages (eight data plus one title page) as a single .pdf document (4.4 MB). For clarity, we have put links to all these images on a separate page that can be viewed by clicking on Jet Blue provided noise information document. A JetBlue press release said that since starting operations 15 months ago, the company has acquired a fleet of 14 brand new Airbus A320 aircraft. "The airline, the best-funded start-up in U.S. aviatio history, takes delivery of an aircraft every five weeks on average. The airline recorded its first monthly profit in August 2000, and has now reached six consecutive months of profitability," the release said. The release noted JetBlue was voted #2 Best Domestic Airline for comfort and service in the 2001 Zagat Airline Survey and recently received top ranking (A grade) in an online survey by PlanetFeedback.com. The Airline also introduced a "No Rubber Chicken" promotional campaign to publicize its policy of serving snacks on board but not meals. "Our passengers tell us they want low fares, new planes, and cofortable seats -- but they hate airline food. with our decision to offer free LiveTV on all flights, JetBlue has decided to offer TV, but no TV Dinners," a release quotes Neeleman as saying. JetBlue's first service from LB will be two daily roundtrip flights to JFK starting August 29, with fares ranging from as low as $129 one way to $299 ("walk up") one way to NY. A JetBlue press release lists the new flights as going from "LA/Long Beach" to JFK (and vice versa). The company, which has billed itself as "New York's low fare, hometown airline," already flies twice daily between JFK and Ontario. LB will be the airline's second focus city; the firm says it's considering service from LB to as many as 14 U.S. cities. 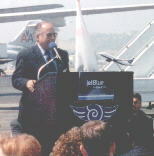 Jet Blue launched service from NYC's JFK Airport in February 2000 and now serves NY with 38 flights per day to 14 U.S. cities. 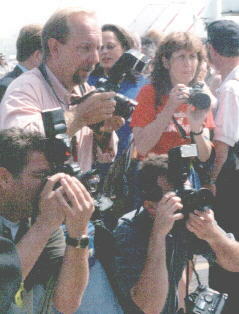 The company announcement received national and NY media attention. The May 23 New York Times Business section reported on the move (quoting among others, 8th district Councilman Rob Webb, noticeably absent from the May 23 news conference) and one LB resident was handed a business card by a reporter from Time magazine. Meanwhile, a satellite TV truck beamed images back to the NYC television market. ...[A]s we looked around and we saw where we wanted to go, we met some really interesting people and, you know, from our experience here, Kristy Ardizzone who's over there, convinced us, Kristy give her a big hand [applause], that really that Long Beach is the place to be. And when we showed up here and we looked at all this great tarmac space and we looked up at this great terminal and we looked at the leadership of this city, from the Mayor and the City Council and to the Airport management, we really realized we could do a fabulous service out of here. ...[W]e knew that we needed some time to do this. We didn't want to come in here and promise you 27 flights tomorrow. And that wouldn't have been good for the city. It wouldn't have been good for the airport. It wouldn't have been good for our company. This is a great day for the City for the Long Beach, and for airline travellers. This is the ability from Long Beach to New York, and it makes Long Beach more attractive to thousands and thousands of new passengers from this area. JetBlue has such a high rating among airline travellers in the categories of service and comfort, and it makes it such an attractive airline for our airport. It's a perfect combination and I think I've heard that several times today, that what we have and what they need and what they can provide us and southern California. We have waited a long time to discover the potential that we know the Long Beach Airport represented for the southern California marketplace. To have that airline be JetBlue, so well respected [applause] in the industry and with the financial resources to follow through on their goals and objectives, is just the best. ...[T]o be the second focus airport means that is, this is their second hub after JFK. So to have JetBlue in the city of Long Beach is something that we dreamed about but wouldn't know it was called JetBlue. But we have found our dream. We could not have asked for a better means of filling the available slots at our Airport. And our citizens are going to like slow growth, their going to like the environmentally friendly jets, quietest in their class. They're going to like the fact that the print of noise [noise footprint] is much smaller and JetBlue faced the same concern in New York, so they know what is needed. They know how to work with the community. ...I know it's going to be good for us, because we are now in the mode of attracting new businesses. This is going to be an enhancement and they need access to the cities of the east, and that's a step forward to become in Long Beach one of the major technology centers that we're growing in our city. ...We have this phenomenon going on in America where, you know, the NIMBY phenomenon, where nobody really wants growth, and it has a lot to do with power plants and everything, and it takes a rare combination of a company that is environmentally friendly and visionary politicians that see that look, there is a different way. And if people are just against growth for growth's sake, I think that's very deterimental, but you have a Councilwoman that is in this district that obviously has a lot to risk in supporting the new growth at Long Beach Airport. And that's Jackie Kell. And she was a supporter from day one. She was able to take a look at these noise charts that we've put together [can be viewed at JetBlue claimed high noise contours. ]...we have lots of noise charts and we want to share those with you. We're going to be in your community. We're going to help you understand that there is a difference between JetBlue and these environmentally quiet and emission safe airplanes, environmentally friendly airplanes, and just any old airplane that could have come in here. When I came to Long Beach into office almost three years ago, I became the elected official the was responsible for managing the Long Beach Airport Marketing "Red Team." The "Red Team" was created by my predecessor, Les Robbins, during his term of office. I had a hard look at the concept of the "Red Team" and decided that our goal needed to be filling the remaining flight allocation slots with a responsible, community oriented airline or airlines, and that the "Red Team" find and attract an airline that would care about our city and our residents. ...I want to put on my transportation hat. I had an opportunity to work for Congresswoman Juanita Millender-McDonald, and she has her district director here with us, and she's a member of the Airport Transportation Committee for the federal government. Nothing good comes easy and many of you have been out before and we've been working to revitalize our airport for a number of years. Approximately six years ago, almost to the day, our city leaders and business community joined hands to resolve the concerns and issues preventing the Airport from marketing and taking advantage of the opportunities in this community. This was done really to secure the vision for the Airport, along term vision, that would protect not only the issue of the business community out here, but the residents of the community surrounding it. 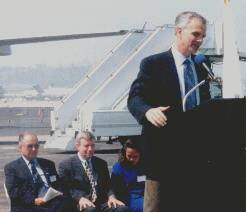 Today we're not only here to celebrate JetBlue's future success but our success to continue our revitalized efforts. Their announcement today demonstrates their ongoing commitment and partnership between the Council, the staff and the Airport business community to promote a balanced vision for our airport, certainly one within our community adopted Strategic Plan. The effort is a partnership to revitalize our commercial service has been an experiment here. We've been here before. But I think today we've proven ourself, and JetBlue has proven their own ability to generate load factors certainly better than the industry average. They're funded and they have the ability to be sensitive to our community and take advantage of what our citizens and what our business community has to offer them. So on behalf of the Airport Area Business Council, and the airport business community, I would like to thank JetBlue for their commitment to our city, and to also thank our city leaders and our business leaders at the Airport for their continued support and our issue to create a vision and a balance for this Airport. Thank you. ...The Chamber commissioned an airport study a few years ago. That study found that daily flights have a six million dollar annual impact on the LB economy and result in 100 new jobs. I hope you can hear our collective "thank you, JetBlue," from the business community. Mr. Neeleman: We were already in the midst of it. And when we saw that article, we said like (laughs) "No, stop, don't say it. "...we were already in the throes of making our decision when that article came out. 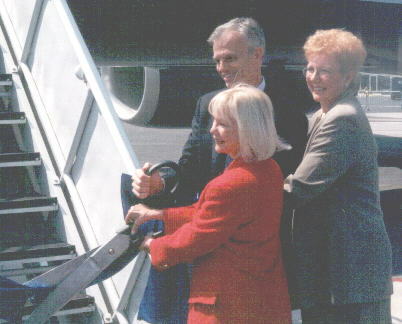 Mr. Neeleman: Now obviously the Mayor was leading the charge and then Jackie Kell kind of led the City Council. And then we met with each of the City Councilmembers and explained our story, you know, and said this isn't just any airline and this is quiet and this is really jobs and this is growth and for the most part everybody bought it. LBReport.com: There was some resistance to it? Mr. Neeleman: Well, you can check the record for the vote. LBReport.com: I'm aware of the vote, but did you meet with Councilman Carroll too? Mr. Neeleman: Yuh, I did. LBReport.com: And what was his reaction? 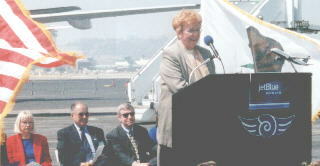 Mayor Beverly O'Neill: "The announcement that JetBlue will be flying out of the Long Beach Airport is great news for Long Beach. ot only with the opportunity to fly directly to Midwestern and eastern cities from Long Beach enhance our ability to attract business, but the carrier's outstanding reputation in the industry will help increae the attractiveness and efficiency of our airport." City Manager Taboada: "JetBlue is going to change the way people in Southern California fly. Area residents have always known that the Long beach Airport was a jewel in the rough - well now the jewel is polished and on the crown. JetBlue is well capitalized and within two years it will provide 27 daily flights that will directly link Long Beach to as many as fifteen major metropolitan centers. We are delighted to welcome JetBlue to Long Beach." Councilwoman Jackie Kell: "I appreciate that JetBlue is sensitive to the surrounding neighborhoods and uses some of the world's quietest, most emission-friendly passenger jets. JetBlue has shown it is committed to working positively wiht communities and we are looking forward to their becoming part of the community here in Long Beach." Airport Manager Chris Kunze: "Long Beach Airport and JetBlue have much in common -- we're both customer friendly and low cost. We're looking forward to our relationship and to the expanded flight offerings and destinations. I am personally very excited about JetBlue's brand new, neighborhood-friendly fleet of aircraft."